Ordered the plan on Wednesday, received the plan on Friday, now that's good service!! First thoughts are the plan is not the greatest print quality, faded in places but you can get enough info off it. My plan all along was to redraw the plan to suit my Laser 75 petrol, going from 55" span (that's what the plan says but for some reason I always thought it was less) to probably about 75" or so, but time will tell when I get to the redrawing bit. I'm hoping to stick to the standard design but don't fancy the banded on wings so will do a neater bolt on affair. It should be a fun model to operate with its slats and flaps, the idea is to make it light and floaty and capable of going very slowly. The plan also shows single servo's for the ailerons and flaps but I'm using 4 to give the option of drooping ailerons and or flapperons or any combination in between! Hi Ian, will be following your endeavours cos I think this will be something interesting! I think I read somewhere that its original wingspan was 48". Now that's a "blast from the past" Ian! The STOL has a very chubby fuselage, have you ever considered slimming it down a little by raising the lower edge to a straight line to tail? KC, that's part of Stol's charm, its odd looks! I love how the cowl doesn't 'flow' in plan view, and also what appears to be a very short nose. I've wanted one of these machines since I was a lad and have never got round to it as there is always a reason to do something else. Now there is a reason to do the Stol and for that I thank ye!! The STOL is a good 'un Ian, you'll enjoy it! There is nothing wrong with enlarging the plan for your own non commercial use. The Plans Handbook shows it as 48 inch span, so I wonder whether the plan as sold now is actually 48 or 55 inch span? It may not matter to Ian but it might affect others who are building it and expect it to fly on .19 engine etc. Pete. I don't want to breach any copyright but if Ian is redrawing, I had imagined there would be significant design changes (knowing him through this forum) that would probably avoid a problem. Nor would I want to put Ian in any kind of difficulty. It was based on a genuine desire to work from something that is currently not available but I would be more than happy to make a formal request to the copyright holders and it does appear that I have at least one supporter from the mass build and hopefully you too if everything is above board. Anyway Ian hasn't replied yet so it may all be academic. I have seen evidence on this forum that if it is influenced by Ian, aerodynamically tested by BEB, covered by Danny and moderated by Pete B the model could have considerable value! The plan as sold by MHS describes it as 48" span, kc. Lets hope the enlarged 75 inch model is a success and that RCME may publish it as a plan. Pete, I know the website and plans handbook say it's 48 inch span so that's why I think we should find out if the plan as sold now is printed to 48 inch. Is it just a caption on the plan that says 55 inch or has the plan been enlarged in error? This will be important to any beginners who may intend to build this as part of the Mass Build. Perhaps Ian can enlighten us with the actual measurement on his plan? Blimey, not looked in here for a couple of days, been away testing toy aeroplanes in the nice weather!! I haven't started redrawing the plan yet, but if anyone wants a copy then I'll have to draw it in a more organised way than what I had planned!! Obviously the copy could be freely available if thats OK with the plans folks. I haven't measured the span on the plan yet, but it definately says 55" in the title box on the plan. The text has clearly been altered though. I'll measure it and get back tonight. Regarding any modifications, I'm trying to stick faithfully to the original but the fuselage might be a bit flexible without any diagonals, but again that is part of the design and its charm. I built a similar designed fuselage a few years ago which was stiffened up by running another 4 longeron down the inside corners of the fuselage and that worked sufficiently without spoiling the look of the original structure. Another change I think will be to the mainspars. Keep the spar sizes in ratio but shear web front and back in balsa as opposed to the single spruce infill between top and bottom spars (to form an I beam) I'll get the plan out and lay the Laser on to work out the sizes. I haven't measured the span on the plan yet, but it definately says 55" in the title box on the plan. I have just measured my plan and it's definitely 55 inches. The plans handbook and website have it wrong. As you will see on the plan shown by Jeff it is described in print as 48 inch and the old handbooks show 48 inch too. 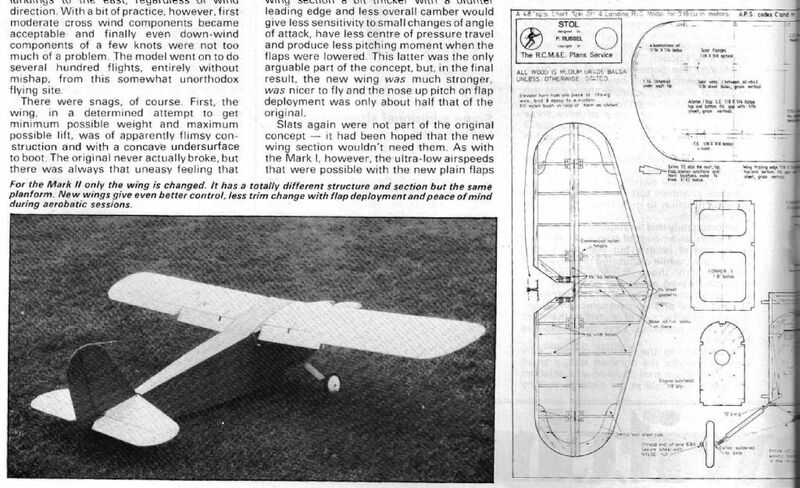 There were many, many items about the STOL in Peter Russel's column -Straight& Level- but I don't recall anything about the wing span being changed or being incorrect. I do recall there being an item about the error in the flap or aileron bellcrank 'handing' and several modified wings ( mark 2 etc) but nothing about span. I wonder whether it has been redrawn and become larger in the process. Has the bellcrank 'handing' been corrected? So it's all down to owners of the original plan or models to tell us what the span really was. And confirm the width of formers etc. If it has now been reprinted at a 15 percent larger size it is unlikely to fly well with old engines of the original size (.19 to .25 I think) although modern engines might be more powerful now. And if it's just the plan being enlarged without the material sizes being increased then a bigger risk of wing failure. As I recall the articles said the wing was built very lightly with minimal material, so there would now be little safety margin left if the plan has been enlarged by 15 percent!